Caitlin Madera is our Employee of the Month for September. Caitlin is the Energy Program Manager for the Commercial and Industrial (C&I) grant program. 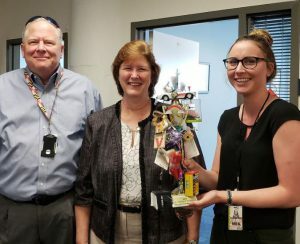 Previously, Caitlin ran the Maryland Smart Energy Communities (MSEC) grant program here at the Maryland Energy Administration (MEA). Caitlin has been a regular fixture at MEA outreach events promoting our programs and engaging with local leaders to explain which energy saving programs can best help their community. Caitlin has a Bachelor’s of Science in Environmental Science and Policy with minors in Sustainability and Environmental Economics from the University of Maryland, College Park. Before Caitlin was a program manager, she held several internships at MEA focusing on wood/pellet heating, residential energy efficiency financing, and renewable energy grants. In her spare time, you can find Caitlin whitewater kayaking and hiking. You can connect with Caitlin on LinkedIn or via email. Applications for the newest cycle of the C & I grant program are due Monday, December 17, 2018. The C & I grant program supports improving the energy efficiency and reducing the energy costs of enterprises in Maryland’s commercial and industrial sector. Read more about one Maryland businesses success with a C & I grant here. Up to $1.2 million is available in funding. Apply today.